Archive for tag "Smart Green Economy"
Ecosummit TV: Prof. Eicke Weber, Director of Fraunhofer ISE, is very optimistic about the future of the solar industry. Firstly, the PV cost curve is going down continuously. Even in Germany with Alaska-type sunshine, we can produce electricity with silicon-based PV for 10-12 cents/kWh. At this cost level, grid parity is already outperformed since 1 kWh costs 22 cents (net) in Germany if you buy it from your local utility. Making your own electricity and storing it in a solar battery is a smart economic idea. Secondly, the global solar market will grow 10 times from 30 GW/year in 2012 to 300 GW/year by 2025. At the same time, higher efficiencies and lower production costs make PV competitive with onshore wind and hydro power. The current oversupply of 60 GW/year is a temporary phenomenon that causes trouble for PV manufacturers for another 1-2 years. Afterwards, Europe should reenter the PV industry with a “multi-GW solar Airbus project” to drive the enormous PV industry again as a technology leader. Ecosummit TV: People are the key success factor for every company. In this spirit, Conrad Ess pitches Green Technology Staffing at ECO13 Berlin. The Mannheim-based recruiting company helps cleantech startups and corporates find new engineering talents. Now Conrad works on a new startup project to develop a crowd recruiting service for the Smart Green Economy. The idea is not to invent yet another job referral service but rather bring the entire recruiting value chain to the social Internet. While the service is still under development, Conrad is interested in talking to business angels and strategic investors who want to join his crowd recruiting startup. We make sure to give Conrad and his team a hand. Ecosummit Ambassadors are planetfriendly university graduates with international background who aim at a career in the Smart Green Economy. Ecosummit Ambassadors support us before and during Ecosummit Berlin on 4-5 June 2013. The deal is simple: As ambassador you get a free ECO13 ticket and work 50% of your time on conference set up, registration, speaker management, participant service, microphone runner and cloakroom. Moreover, ambassadors get involved in the development and promotion of our new online platform Ecosummit Market. 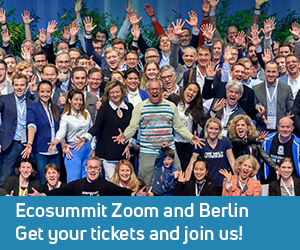 We selected 23 Ecosummit Ambassadors and our ECO13 Berlin team is complete. Check out Ecosummit London 2013 for your next chance to become Ecosummit Ambassador. Only successful cleantech startups have a positive impact on climate change and global resource problems. The problem is that most hardware-based cleantech startups are very capital and time intensive. Entrepreneurs and investors constantly look for new strategies to accelerate the development and marketing of smart green innovation. Applying the lean startup philosophy to cleantech could be the perfect solution. Cleantech startups also search for scalable business model, product market fit, validated learning from customers and engine of growth. In this context, it was a special honour to go to Japan – especially after Fukushima – and speak about Lean Cleantech Startup at the spectacular New Context Conference Tokyo 2012 two weeks ago. Ecosummit Ambassadors are planetfriendly university graduates with international background who aim at a career in the Smart Green Economy to solve our global climate, resource and economic problems. We selected 13 Ecosummit Ambassadors to support us before and during Ecosummit Düsseldorf on 14-15 November 2012. The deal is simple: As ambassador you get a free ECO12 ticket and work 50% of your time in important jobs such as registration, speaker management, networking angel, participant service, microphone runner and cloakroom. Our Ecosummit Düsseldorf team is complete now. Ecosummit TV: “We are sure that we can supply 100% renewable energy,” says Prof. Dr. Juergen Schmid, Director of Fraunhofer IWES. The necessary transformation of our energy system to the 100% renewable energy system can be done and must be done as soon as possible because global energy demand and CO2 emissions grow exponentially. Renewable energy and energy efficiency are the 2 pillars of the future energy system. Prof. Schmid’s scenarios are an encouraging role model for other countries. If you want to get the big picture how to do it, this Ecosummit TV video is must-see. Let’s accelerate together the global transformation to the Smart Green Economy powered by 100% renewable energy. In fact, that’s exactly why we do Ecosummit. Ecosummit TV: Michael Linse, Partner at Kleiner Perkins, talks about his favourite greentech investing framework at Ecosummit Berlin and comes to a scary conclusion: Humanity is about to hit a wall. Cleantech is about the impact of the macro trends on huge industries that will lead to a more sustainable functioning of these industries. The demand side of the equation is changing, in fact, it will go up tremendously. From now until 2030, 3 billion people will join the global middle class. This is significant as the resource consumption pattern increases most dramatically as people move from the scope of poverty to the middle class. Ecosummit TV: Joerg Fabri, Managing Partner of the consulting firm allocate, talks about a holistic business strategy for the utilities to manage the energy turnaround (Energiewende). To implement the transformation to the clean energy system companies need to reallocate their 4 key corporate resources: capacities, capital, people and energy and materials. There is a new paradigm driven by energy efficiency which means that the former business model of megawatt growth will not work anymore. The smart green utility of the future has to become an allocation manager that learns how to better manage the increasing complexity in the supply side and the demand side. Ecosummit TV: Tom Schulz, Co-Founder and COO of Entelios, pitches the German demand response management startup at ECO12 Berlin. According to the Smart Energy Demand Coalition, intelligent cooperation between consumption, transmission, distribution and generation acting as equal partners in the electricity market is at the heart of the smart grid. Entelios sits between the demand side and the supply side and balances both by aggregating and shifting electricity demand away from peak hours, or rather peak minutes. Ecosummit TV: Hansjoerg Sage is a Partner at Gimv and pitches the cleantech VC from Belgium at ECO12 Berlin. Gimv is around for 30 years and has €1.8B under management of which 30% is venture capital. Hansjoerg points out that cleantech investing is about solving very big problems and is driven by fundamental trends such as climate change, energy supply security, urbanisation, scarcity of resources and environmental concerns that will be a top human priority for the next couple of decades. However, cleantech investments have a particular risk return profile that needs to be managed. Ecosummit TV: Erwin Burth manages business development for Autodesk in Europe in the cleantech industry. Autodesk was founded 30 years ago, is a public company with a market cap of $8.2B and plays a pivotal role in the Smart Green Economy when it comes to designing smart green products. At ECO12, Erwin presents Autodesk’s design philosophy and its powerful design software solutions for the physical world. Autodesk believes that all problems can be solved with the help of intelligent design. In fact, that’s exactly what every cleantech startup building hardware needs. Autodesk is a very generous corporate and offers free software with a value of up to €120K to cleantech startups. Many Ecosummit startups are already a member of the Autodesk Cleantech Partner Programme such as Smart Hydro Power that won the Ecosummit Jury Award 2012. I strongly recommend that you apply asap. Ecosummit TV: Mar Alarcón is the founder and CEO of Social Car, Spain’s leading p2p car sharing operator. Before Social Car Mar co-founded Social Energy, a PV project developer based in China. I like the brand name Social Car very much and I am very bullish with regards to the business model of p2p car sharing as it is very capital efficient and scaleable. Mar did a great pitch at Ecosummit 2012 on 22-23 March in Berlin. 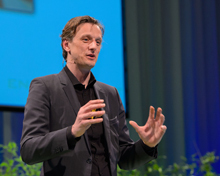 Ecosummit TV: Ecosummit Founder Jan Michael Hess opens Ecosummit Berlin 2012 on 22 March at Radialsystem. The sun is shining and many smart green people are in the house, visibly motivated to share ideas and grow their network. Our third Smart Green Business Conference is climate neutral thanks to the carbon offset powered by ClimatePartner. According to Bart Markus of Wellington Partners, Cleantech includes many big markets such as wind, solar, water or efficiency. Big markets attract lots of VC money and absorb experiments and execution mistakes. According to Prof. Karl Leo, Europe is good at basic research – this is our culture – but bad at application and bringing new ideas fast to global markets. 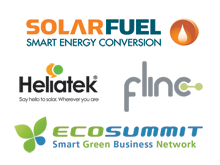 At ECO12, we aggregated 225 startups, VCs and corporates to accelerate Smart Green Innovation. And we announced Virtual Ecosummit powered by ubivent. Let the show begin! Ecosummit TV brings to you the first video of Ecosummit 2012 (ECO12), our third Smart Green Business Conference which took place on 22-23 March 2012 in Berlin. Futurist Gerd Leonhard, CEO of The Futures Agency, talks about Sustainable Capitalism and why we have to move from Ego to Eco. People and corporations alike should be sustainable by default in everything they do. The Internet enables a decentralised sharing economy in which we share energy and all other resources collaborating instead of competing. A new form of sustainable capitalism is the only way forward into a smart green future. Smart Hydro Power (Gold, €7.500), Heliatek (Silver, €5.000) and Carpooling.com (Bronze, €2.500) win the Ecosummit Award 2012 Jury Voting. The German startup Smart Hydro Power convinced the expert jury which consisted of 53 judges representing smart green VCs, corporates, utilities, startups, press and service providers. Smart Hydro Power produces small power plants for rivers that generate renewable hydro energy for offgrid communities in developing countries. Organic PV startup Heliatek wins the Silver medal for taking solar energy where it has never been before. Carpooling.com is awarded the Bronze medal for their success with bringing ride sharing to the mass market. The winners of the Ecosummit Award 2012 Facebook Voting are Blablacar (Gold), Carpooling.com (Silver) and MyCO2 (Bronze). The Ecosummit Award 2012 is sponsored by Ecosummit and Climate-KIC with special media support of Wirtschaftswoche. Thanks a lot to all our nominees, judges, sponsors, partners and winners. We are proud of you! The ECO12 Agenda is online. 30 smart green startups are nominated for the ECO12 Award. 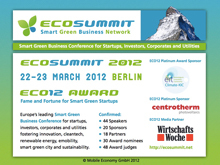 Press Release – Berlin, 13 February 2012: Ecosummit 2012 (ECO12) takes place on 22-23 March in the Radialsystem in Berlin. The 3rd edition of the international smart green business conference gathers around 400 executives of startups, investors, corporates and utilities. ECO12 focuses on cleantech, renewable energy, electric mobility, smart green city and venture capital. Already 30 smart green startups are nominated for the ECO12 Award. Die ECO12 Agenda ist online. 30 intelligente grüne Startups sind für den ECO12 Award nominiert. Pressemitteilung – Berlin, 13. Februar 2012: Ecosummit 2012 (ECO12) findet am 22. und 23. März im Radialsystem in Berlin statt. Die dritte Auflage der internationalen Konferenz für Smart Green Business erwartet rund 400 Manager von Startups, Investoren, Konzernen und Energieversorgern. Auf dem ECO12 geht es um Cleantech, erneuerbare Energien, Elektromobilität, Smart Green City und Venture Capital. Bereits 30 intelligente grüne Startups aus 6 Ländern sind für den ECO12 Award nominiert. Ecosummit Ambassadors are planetfriendly university graduates with international background who aim at a career in the Smart Green Economy to solve our global climate, resource and economic problems. The ECO12 organisers need 20 Ecosummit Ambassadors to support us before and during ECO12. We are grateful for your applications and selected 20 ambassadors coming from India, Malaysia, Serbia, Bulgaria, Sweden, Zimbabwe, USA, Turkey, Kazakhstan, Switzerland, Spain, Indonesia, Poland, UK and Germany. The deal is simple: As ambassador you get a free ECO12 ticket and work 50% of your time in important jobs such as registration, speaker management, networking angel, participant service, microphone runner and cloakroom. Please do not send further applicatiions. Now is a good time to meet our new ECO12 Ambassadors – your future teammates.